The picturesque seat of Cumberland County, the fastest growing county in the state, is just a hop, skip and a jump away from the capital city of Harrisburg, an hour and a half drive to Baltimore and a two-hour drive to the city of brotherly love – Philadelphia. It is also home to the largest car shows east of the Mississippi. 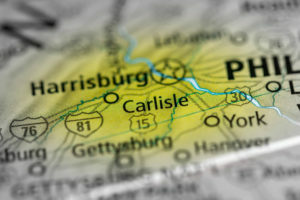 Within a two-day drive of approximately 80 percent of our nation’s population, Carlisle has been predominantly known as a trucking epicenter – as well it should be. While the trucking industry provides hundreds of thousands of jobs, and has a huge economic impact on the region, can Carlisle be known for something else? Locals know it is a great place to live, work and play, and have a deep sense of pride in their quaint little town, but what about those who live outside of the region? How can we bring to their attention that Carlisle has more to offer? Ted Pfeifer, Vice President of Retail with Landmark Commercial Realty Inc., believes that Carlisle can most assuredly be known for more – but with a prerequisite. Pfeifer believes Carlisle will likely see growth from commercial as well as residential developers once the borough’s enhancements have been made. Carlisle is rich in historic, century old educational institutions right in its backyard – the Army War College and Dickinson College. They attract senior-level military officers as well as prospective students regionally, nationally, and internationally. An educationally-rich town with a thriving trucking industry paired with a finished urban development project can only aid in the growth of the community that is on a verge of a renaissance. Although Carlisle’s location on the map will never change, and the likelihood of it continuing to be a trucking and education hub is both expected and needed for economic expansion in our state and country, the opportunity for growth is within reach. Carlisle can become a must-see destination when visiting the region. It can become a place that residents in the region frequent whether they want to do some shopping, grab a bite to eat or just take a stroll. But be patient. Good things take time.